On this page we will list some of our current collection, what we are proud of, what is currently breeding, etc. While not everything will be listed here we will attempt to show one of each morph with a brief description and a few high resolution photos when available. 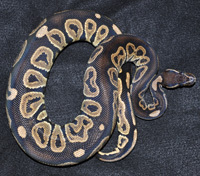 This simple recessive morph is one of the oldest and most noticeable morphs available. A white snake with a yellow pattern and pink/red eyes. This Co-Dom morph is created by crossing Lesser Platinum X Lesser Platinum. The result is a pure white snake with blue eyes! This Co-Dom morph is created by crossing Mojave X Mojave. It is very similar to the Super Lesser, but has gray on the top of it's head and sometimes a slight pattern visible on the body. This Co-Dom morph Is characterized by increased melanin (black pigment). The super form is a solid black snake with black eyes. 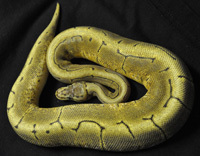 This double morph (Pastel X Spider) is a very popular choice because it combines the spider pattern with a bright yellow coloration for a very reasonable price. 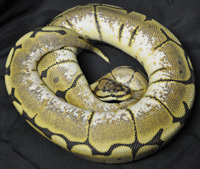 This dominant morph is much brighter than a normal ball, and usually has a very clean pattern as well. It can be used to brighten up just about any other morph and is currently being crossed with many other base and designer morphs because of this quality. Like the lesser, this Co-Dom morph is usually used to brighten up other morphs. 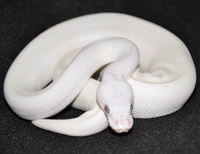 The super form is a Black Eyed Leucistic, a white snake with black eyes. 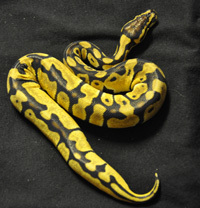 This triple morph (Pastel X Pastel X Spider) is even more amazing than the Bumblebee. It Is bright yellow with the Spider pattern. It usually doesnt "brown out" like most Bumblebees, and the pattern is usually gray instead of black. This Co-Dom morph is used to create many of the most popular designer morphs available. It can make any other morph lighter and brighter and it's super form is a Blue Eyed Leucistic. This double morph combines the pattern of a spider with the color of a lesser. As hatchlings, some are so light that they are almost white. 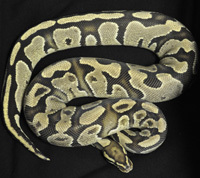 This double morph (Mystic X Mojave) is one of the most stunning morphs available. It almost appears like it is glowing! 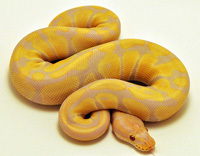 This double morph (Pastel X Champagne) Is a mostly patternless snake with a very light yellowish coloration. This double morph (Pastel X Lesser) features a bright vivid color and can be combined with many other morphs to enhance their coloration. 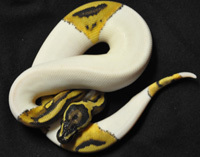 This double morph (Pastel X Spectre) is brighter yellow and is also a key ingredient in the Pastel Super Stripe! This recessive morph is very unique. It has an almost normal colored pattern with random patches of white. Some have almost no white at all, while others are over 95% white! 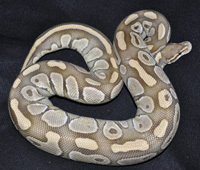 This dominant morph has a very unique pinstripe pattern, hence the name. It is used to alter the pattern of other morphs. This double morph (Spider X Pinstripe) combines the Spider pattern with the Pinstripe pattern to create a very clean, reduced pattern snake. 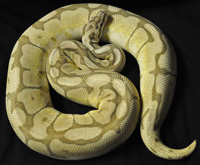 This triple morph (Pastel X Pastel X Mojave) is a very light morph that can create several popular designer morphs. 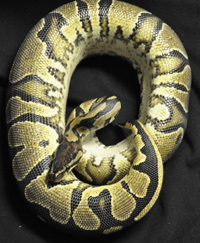 Toffee Ball python description coming soon. 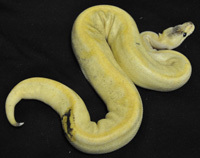 This double recessive morph (Albino X Axanthic) is much lighter than an albino. As a hatchling it is almost pure white with pink/red eyes. Later, some light yellow coloration comes in. 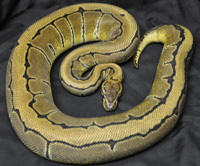 The yellowbelly is a very unique Co-Dom morph. To the untrained eye it may look like a normal, but it is a key ingredient in the Super Stripe and it's super form is the Ivory ball.